Our West Coast IPA hits you with a ton of juicy hop flavor that shines out from a substantial and complex malt backbone. We use Citra, Amarillo, Centennial, Warrior, and Chinook in 10 separate additions to provide the intense hop blast found within this can! This beer is phenomenal. Amazing, thick aroma with grapefruit, orange, grass, and a biscuity dankness. Taste is ridiculous. Just a juicy, dank, hoppy, resinous IPA with great balance and flavor. The hops are in your face, but the right amount of maltiness softens the blow. Feels a bit sticky, which I love in an IPA. One it warms a bit it really opens up and almost drinks like a DIPA. Props to NoDa for this beer. Its easily one of the best IPAs I've ever had. Also - Just did a side by side with Heady and this beer easily won. I don't know how fresh the Heady is that I got in a trade, but it couldn't stand up to the HDR. Call me crazy, I'm just calling it like I taste it. A hazy, glowing light copper color with an orange hue. An aggressive pour produces a good head stand of rock to creamy off-white bubbles. The foam has a lasting head retention and leaves a light lacing on the glass. A strong hops aroma, smelling of citrus, orange, pineapple and a bit of resinous pine. There is a fairly strong herbal and grass dry hopped aroma in there along with a mostly clean malt sweetness with notes of caramel. There is a slight alcohol sweetness as well. An aggressive hops bitterness with lots of citrus hops flavor dominate. The hops bring strong flavors of pineapple, orange and a bit of orange peel along with a bit of pine and moderately-strong herbal flavors. There is a moderately-light sweetness that is mostly malt along with some alcohol towards the dry finish. There is a lingering hops bitterness with a citrus aftertaste. A medium bodied beer with a moderate creaminess and a medium-strong level of carbonation. 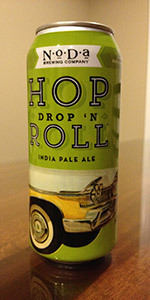 A remarkable IPA, the hops really shine in this beer with a depth of American Citrus hop aromas and flavors dominating. The bitterness is solid but balanced making for an awesome beer. Good to see I can get bottles of this beer now in GSO.Poured into an imperial nonic a deep burnt orange with a great looking lacey white head,it looks creamy and left a nice sheet of lace as it settled into a frothy mass.Tropical fruits abound in the nose along with some sugary sweetness and more mild herbal hop notes,great hop complexity.Tropical fruits on the palate as well along with big herbal/grassy flavors,there is a sugary base along with some biscuit but it doesn't interfere with the big hops.For me this is easiest the best beer I have had from NoDa,the hop profile is just great,probably one of the two or three best "big" IPA's brewed around here. Pours a burnt orange with a 1 finger white head that lingers for a while. Light carbonation runs up the glass and the body is fairly clean and clear. The smell is pine up front. Fairly muted. A little bready malt in there with a touch of sweetness coming though as well. First sip is bitter pine with some orange mixed in there. The finish is tongue-punchingly bitter. Medium body and coats the tongue completely. Bitterness lingers for a while. This is a good beer for those who like bitter, pine bombs. It's well made and very drinkable but not my favorite. I got a lot of bitterness and not in a good way. So much that it tasted like a home-brew with residual hops in the bottom. The malt didn't seem to match up well with the brew either. Not sure if it was just the can I got or how the beer actually tastes. Can't say I recommend this one. Poured from the 16 ounce can into a snifter. American IPA brewed with Citra, Amarillo, Centennial, Warrior, and Chinook hops. Poured from a 16oz can into a Goose Island tulip. The pour is slightly hazy, apricot in color, and sports a creamy eggshell white head that retains quite well. Lots of bitter, oily, sappy hop aromas on the nose. Pinetrees, flowers, grass, and grapefruit. Medium body and hop-forward flavor. Marmalade, honey, bread, and citrus fruit. Kind of a syrupy, resiny bitterness instead of the bright, fruity bitterness that I prefer. The balance is not bad, but the hop bill just isn't working for me. I'm no brewer, but is it a good idea to use five different hop varieties in one beer? The beer can't decide if it wants to taste like pinetrees, rosehips, or a big juicy orange. Everything is muddled and the resulting bitterness is not all that pleasant. I was anxious to try this beer because I heard some great things about it, but I was a little disappointed. Perhaps I got a bad (old) 4-pack, but I just wasn't impressed. I will likely try it again though. Shazaaam! One of my favorites. I love living in Charlotte around these great breweries! Canned 2 days ago. There is a big fruit aroma when you pop the can. The beer pours a dark orange to amber color. The taste is balanced with citrus, tropical fruits, pine, and a sweet bready malt. You can taste a small amount of alcohol which brings it down a little.